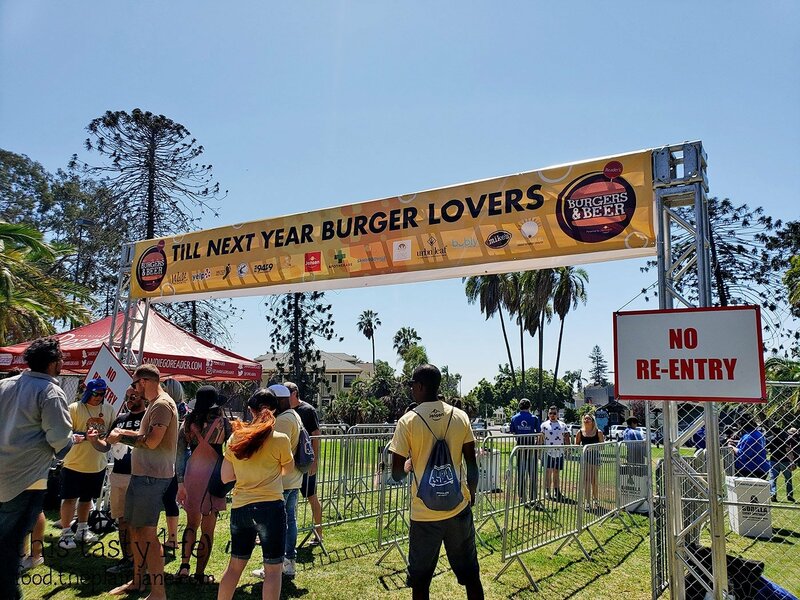 Back in early September, I was invited to the annual San Diego Reader Burgers & Beer fest that took place over in Golden Hill Park on September 8th. I promised myself I would limit my eating to “two bites” per sample so I could get a taste of everything but also not completely pig out and feel awful about myself later. And it worked! I stuck to my two bite rule and I was able to sample a lot and not feel sick afterwards. Woohoo! Jake was my partner in crime for this event and we were able to share all of the samples since I was doing the two bite rule. Let’s do the burgers first! 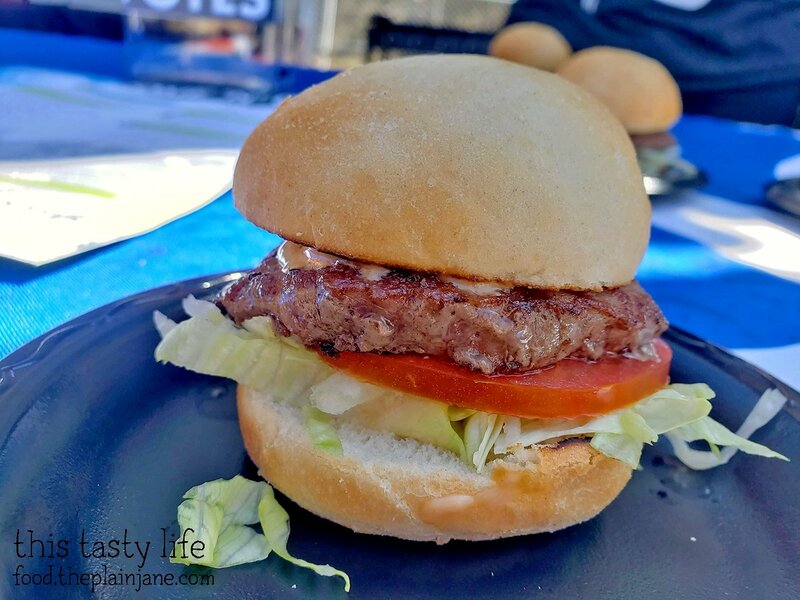 Our first burger sample at Burgers and Beer was this Bare Lil Lamb burger from Dunedin New Zealand Eats. 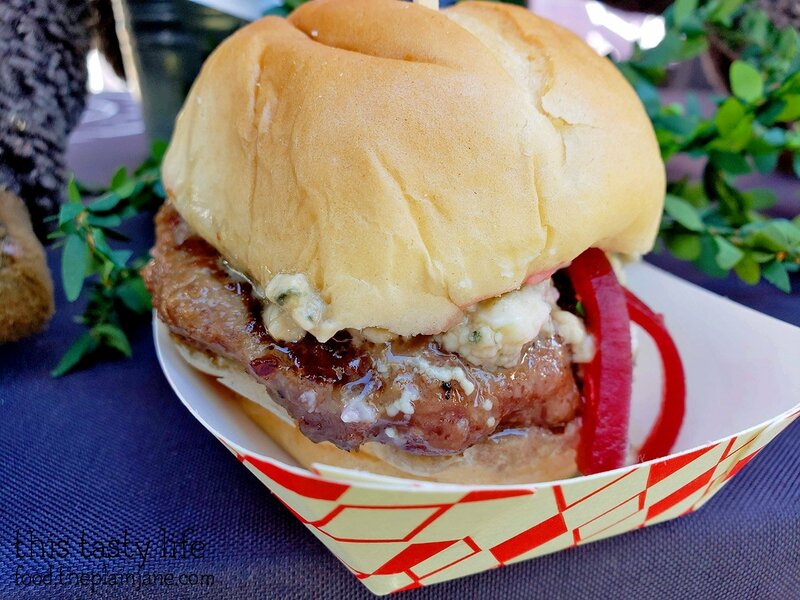 The lamb burger was topped with blue cheese, mint dressing, beet root, aioli, and a sweet tomato chutney. 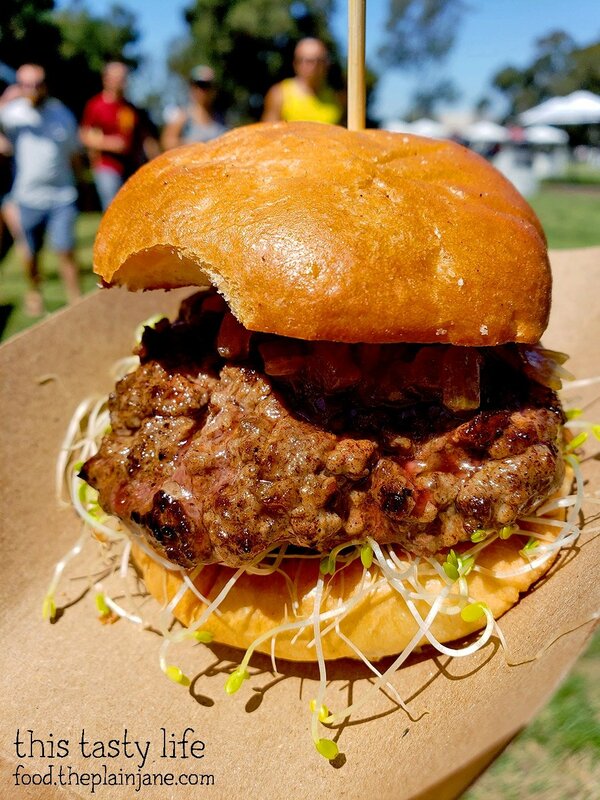 I was pleasantly surprised at how juicy and delicious the lamb burger was. 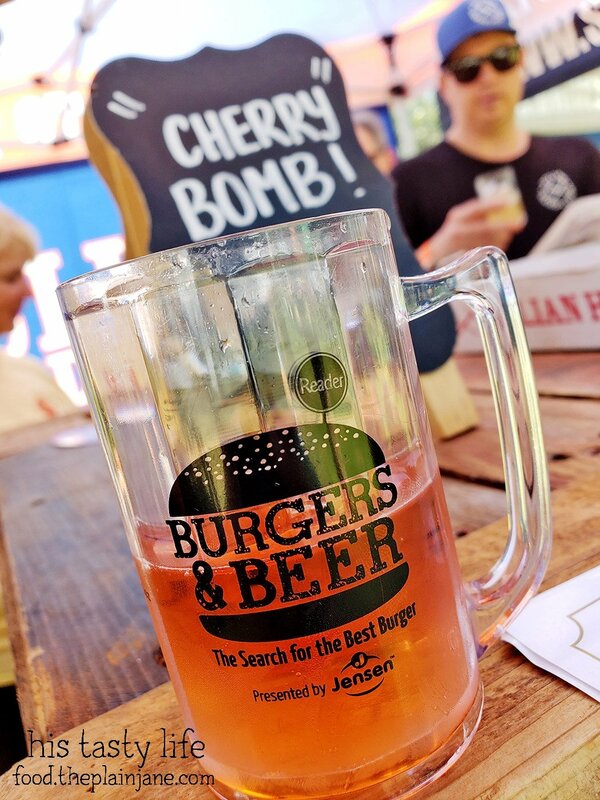 Like… I would totally go here and eat this burger again. The lamb was really tender and full of flavor and the toppings made this really stand out. One of my favorites from the event! Jake doesn’t like lamb so he passed on trying this burger. 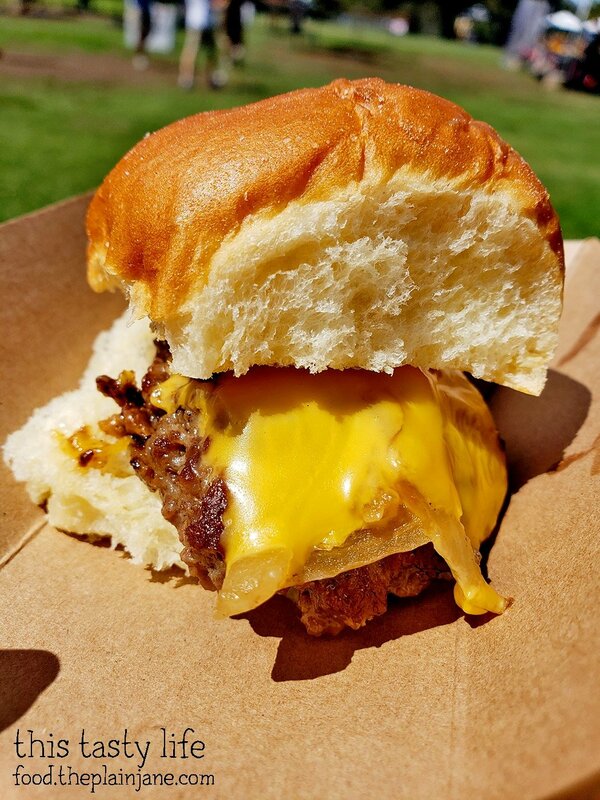 Next up was a simple slider from Tavern+Bowl. They toasted the bun on this one and it seemed like a solid burger. 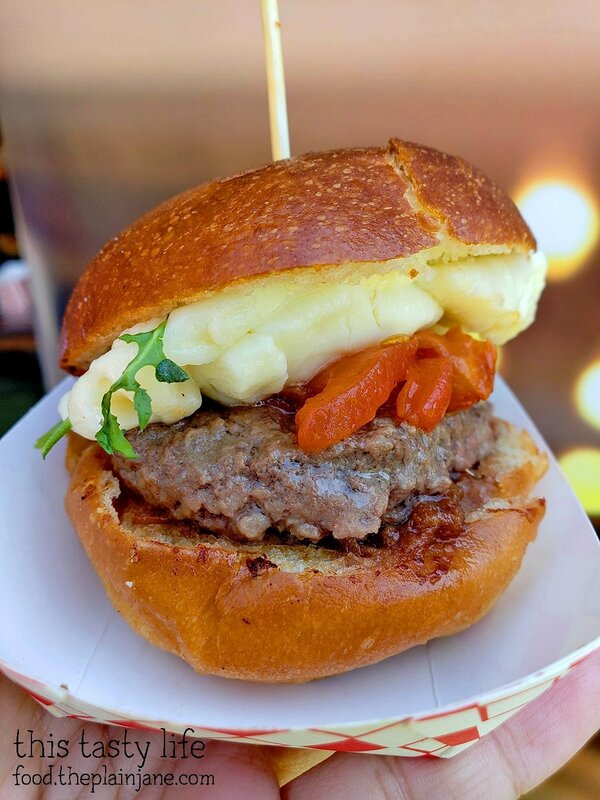 The slider burger from Davanti Enoteca was a sight to behold with cheese curds on top! I quite like the cheese curds which gave it a richer, cheesy flavor but boo to the arugula. Also nicely toasted bun! 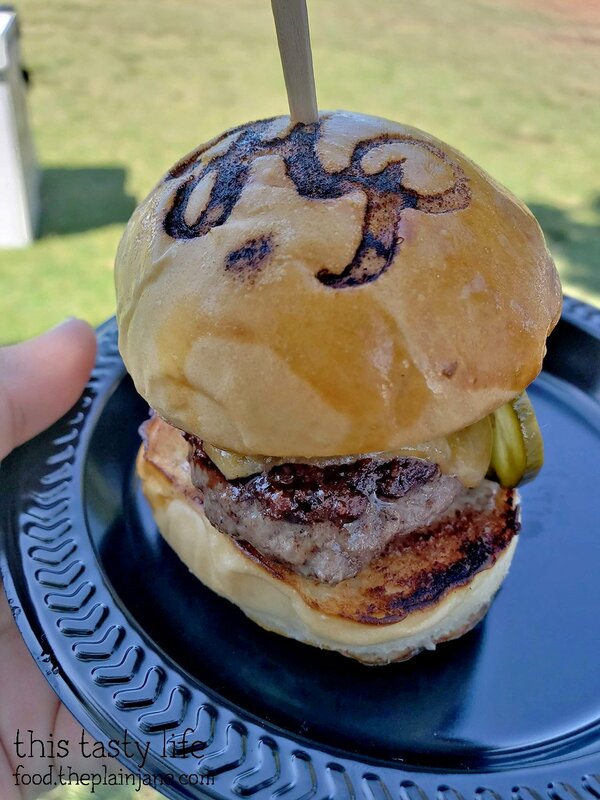 The branded burger from Hundred Proof was such a cute little mini creation! 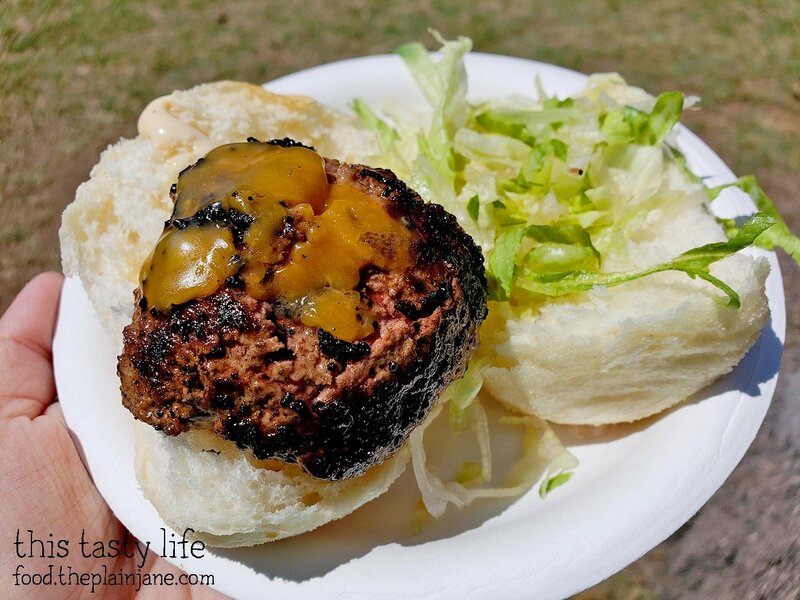 Here’s another look at the HP Burger from the side… in direct sunlight. Ha. 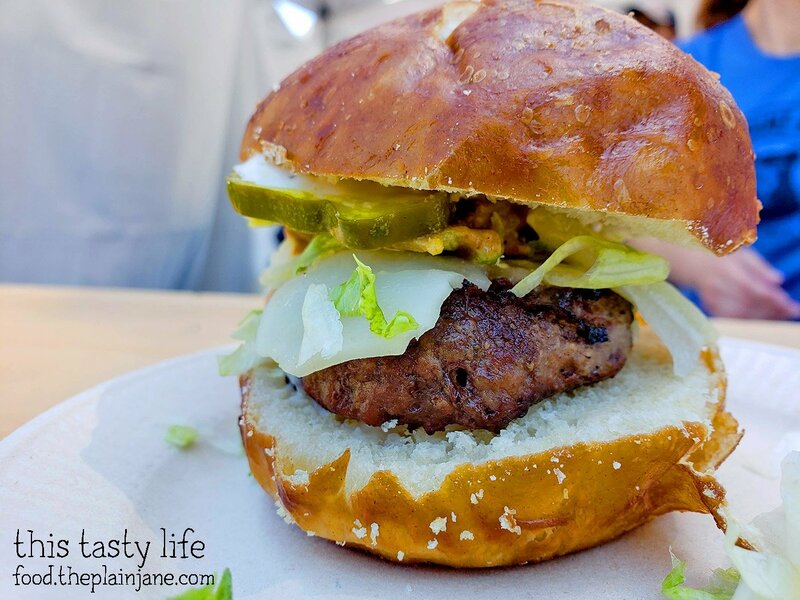 The slider is topped with English cheddar, HP spread, pickles, onion, and lettuce. I loved the spread on this burger plus the toasted bun but what I really enjoyed was the burger itself. 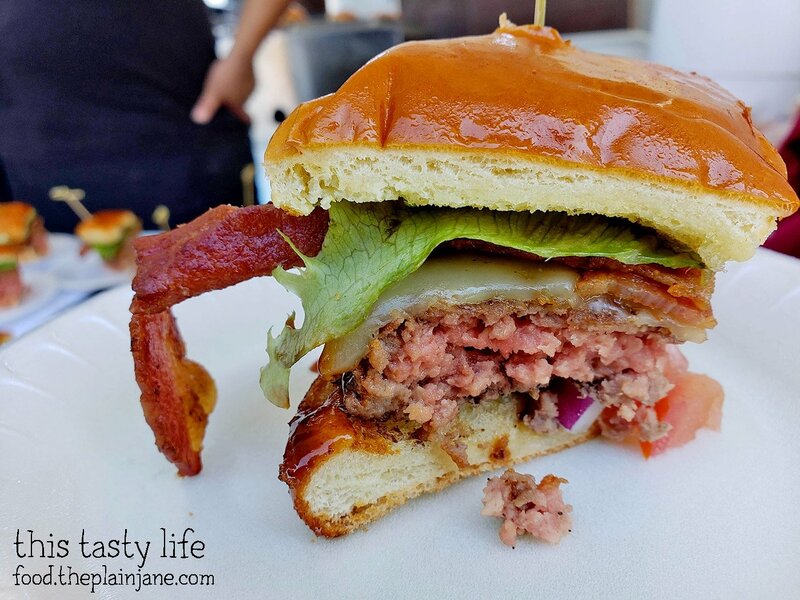 The meat was well seasoned and tasted terrific on it’s own which is a testament to a good burger. The cheddar was also excellent and nicely melted. 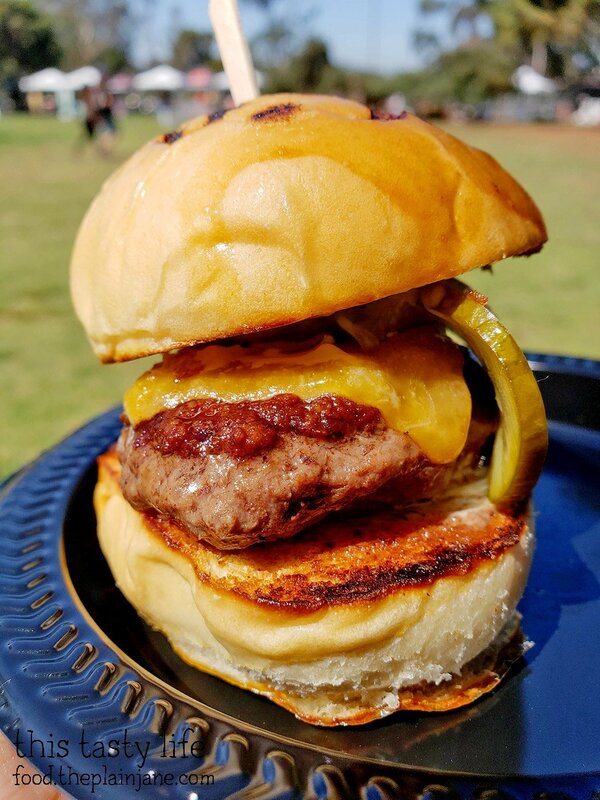 This burger got my vote for the event! 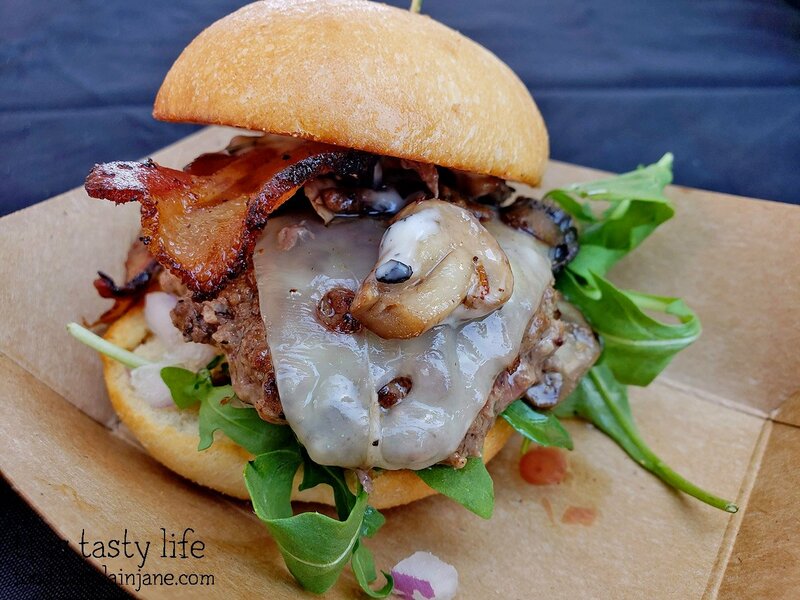 Fifty-Two East featured their Truffle Shuffle burger at Burgers and Beer which is a burger with bacon, roasted mushrooms, red onion, swiss cheese, arugula, and truffle aioli. I quite liked the mushrooms and bacon myself! Maggie’s Cafe offered cut up samples of their burger rather than a slider. 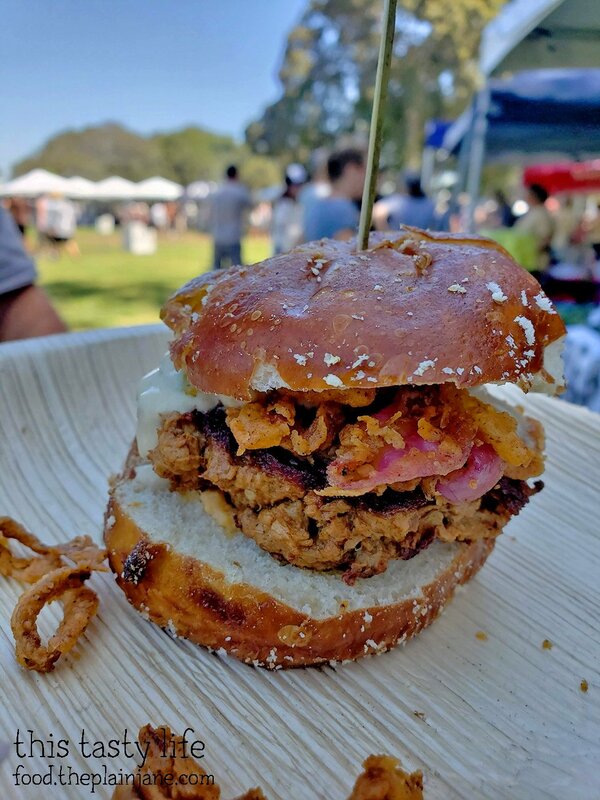 Waypoint Public had a Pretzel Burger slider with ground short rib and brisket, Carolina BBQ pulled pork, buffalo truffle aioli and fontina cheese on a pretzel bun. The bun was cold and there was too much bread on this one. 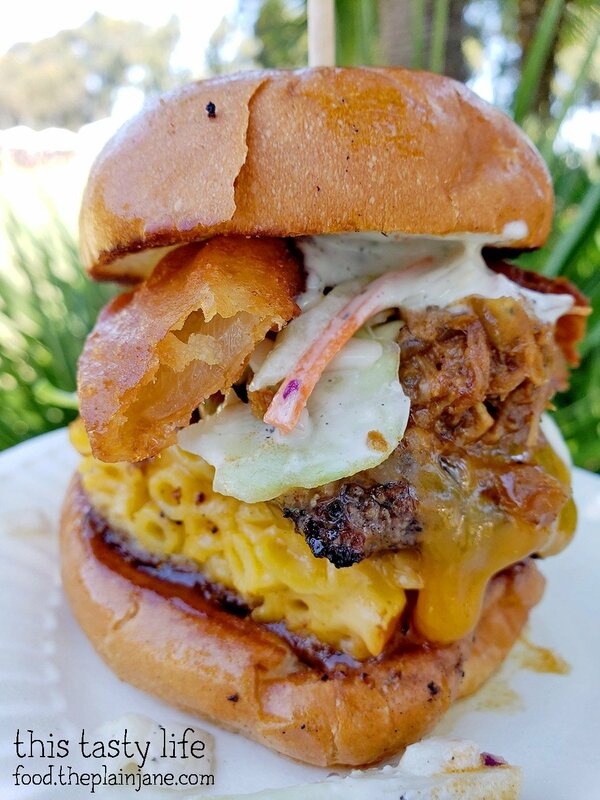 Funky Fries and Burgers combined two of their past winning burgers into one with this Pulled Pork Mac & Cheese Burger. It was quite unwieldy to try and eat this since it was so tall and had an onion ring on top. I liked the flavor of the burger but it felt a bit like overkill to me. I’d rather just have one or the other, not both! Pure Burger had these sliders topped with bacon, avocado, grilled onion, spread and sprouts. The meat itself was incredibly juicy and tender though I didn’t care much for the sprouts, personally. But the patty tasted great! 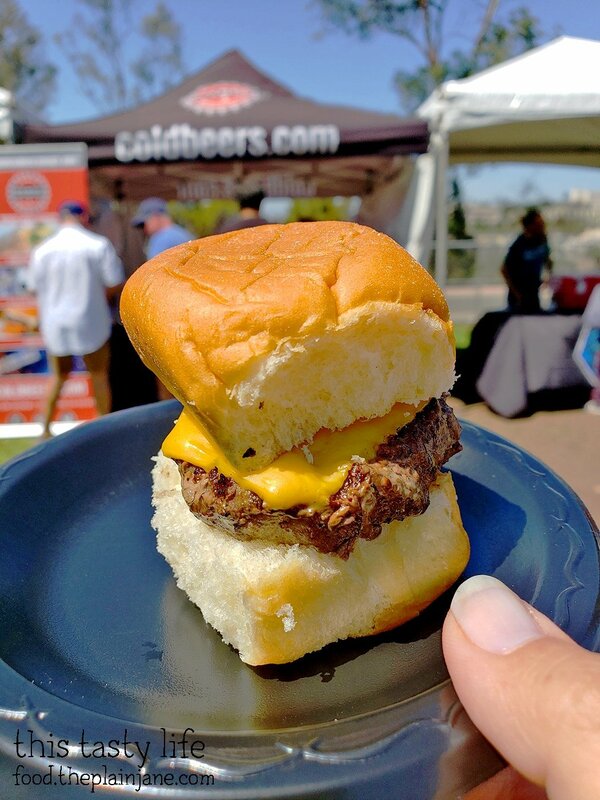 Cold Beer and Cheeseburgers offered a cheeseburger slider on a Hawaiian bun. 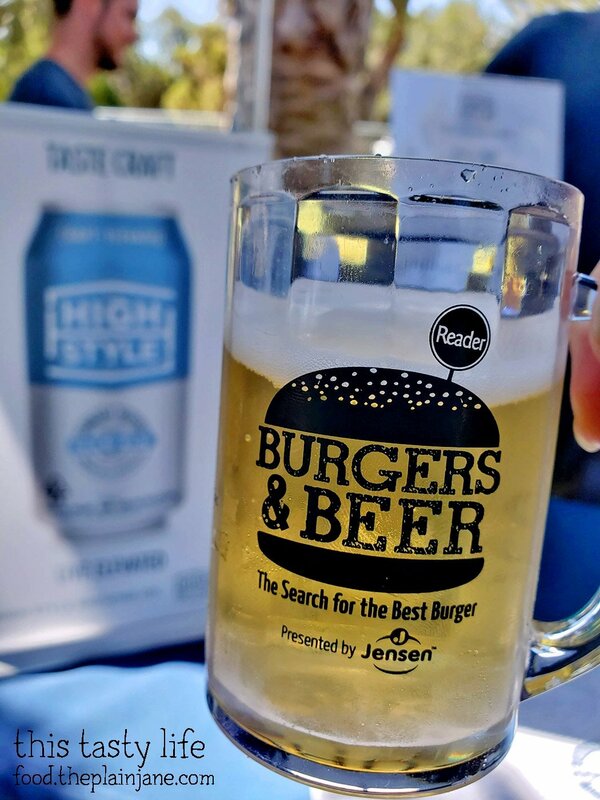 Backyard Kitchen and Tap had a Chipotle Impossible Burger which is a vegetarian burger with crispy onions, avocado black bean hummus, and a garlic “aioli” on a pretzel bun. 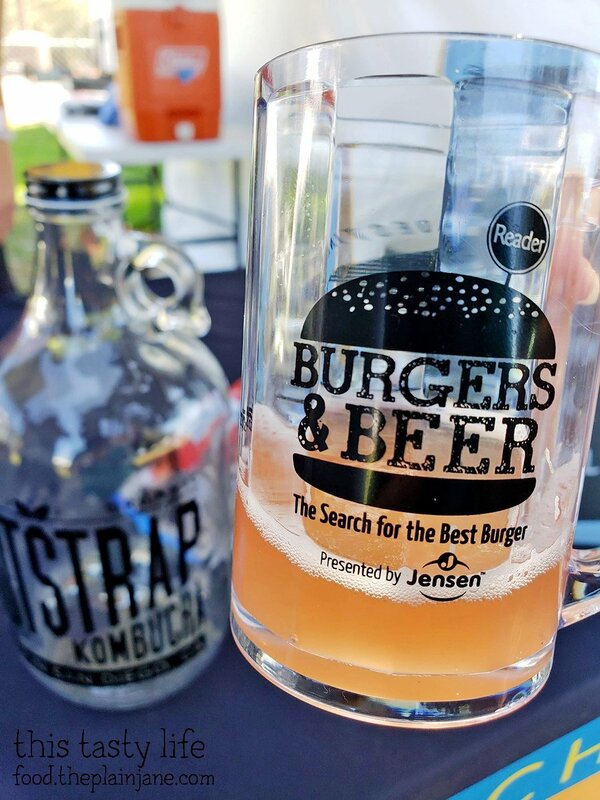 This burger won for Reader’s Choice at the festival. I would say something about it but I honestly don’t remember what it tasted like! Burger haze, I guess. True North Tavern was the last burger we tried. And again, I don’t really remember anything about it! This list is just a few of the items we tried. 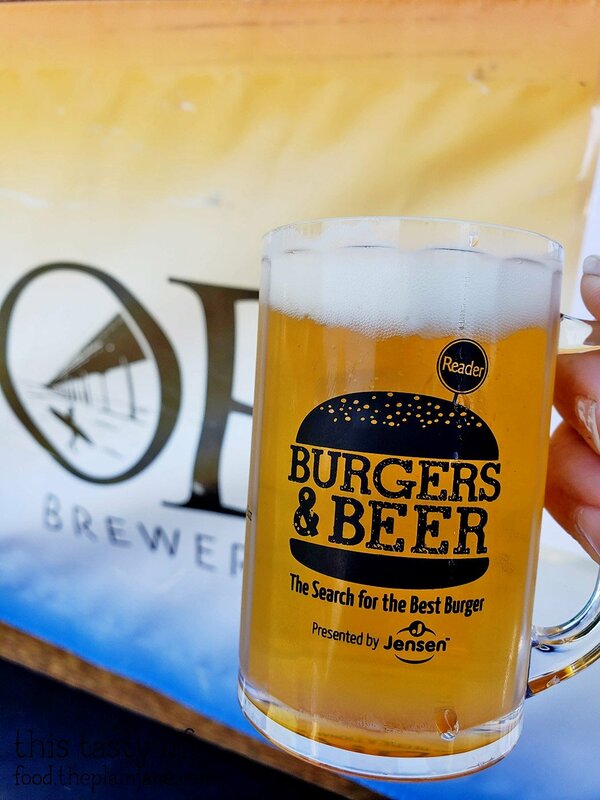 The first one we had was the Cape May Avenue IPA from OB Brewery. This was a sample of “Rampers”, a golden sour ale brewed with honey and barrel aged for 18 months. From Sour Cellars. 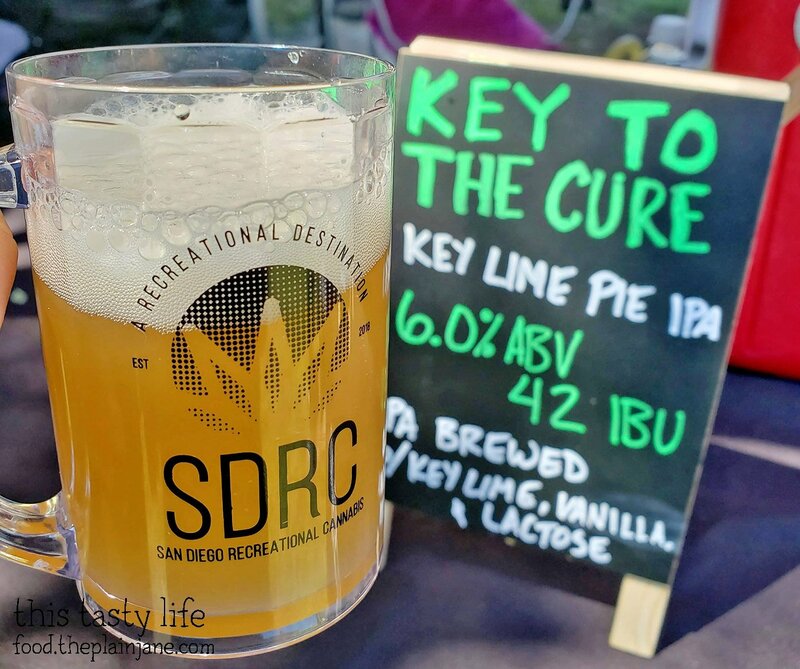 I liked the name of this and the idea of a Key Lime Pie IPA from Savagewood Brewing Company. 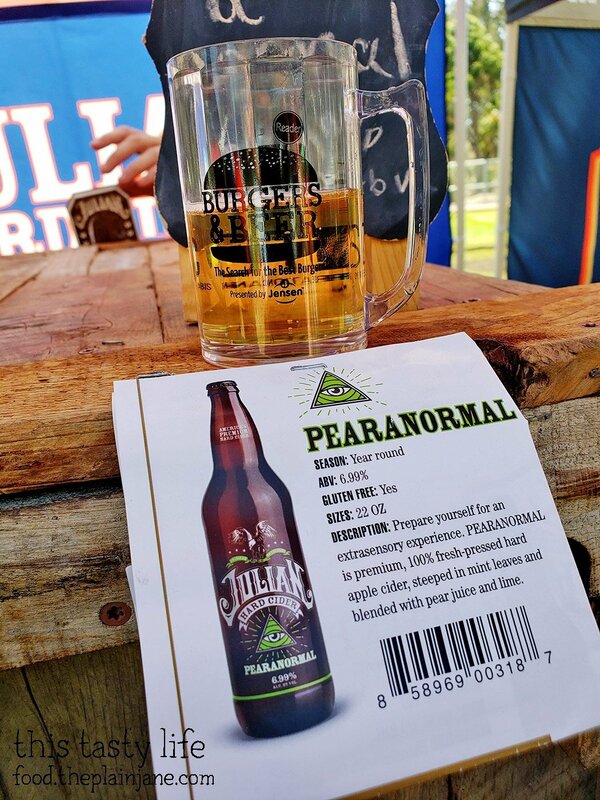 The Pearanormal! 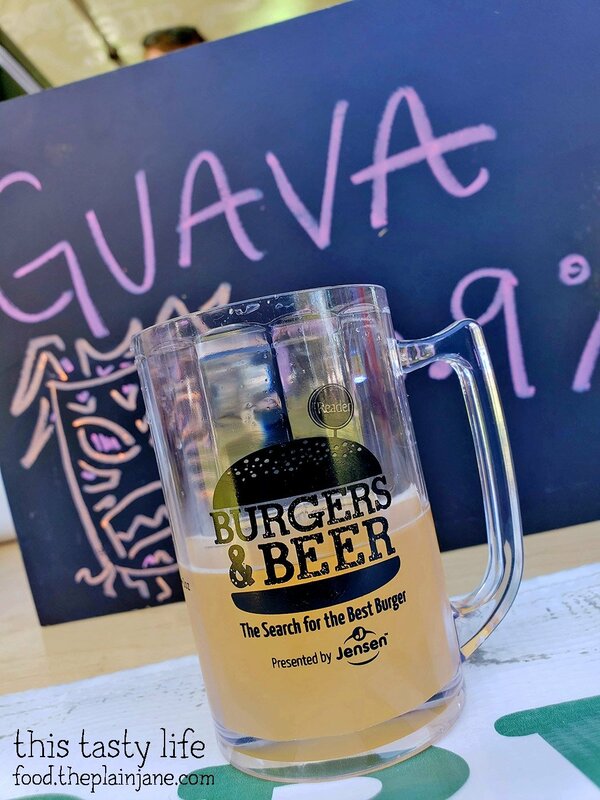 This was my favorite drink from the event. I’m more of a cider girl than a beer girl. I liked the light peary flavor on this one. 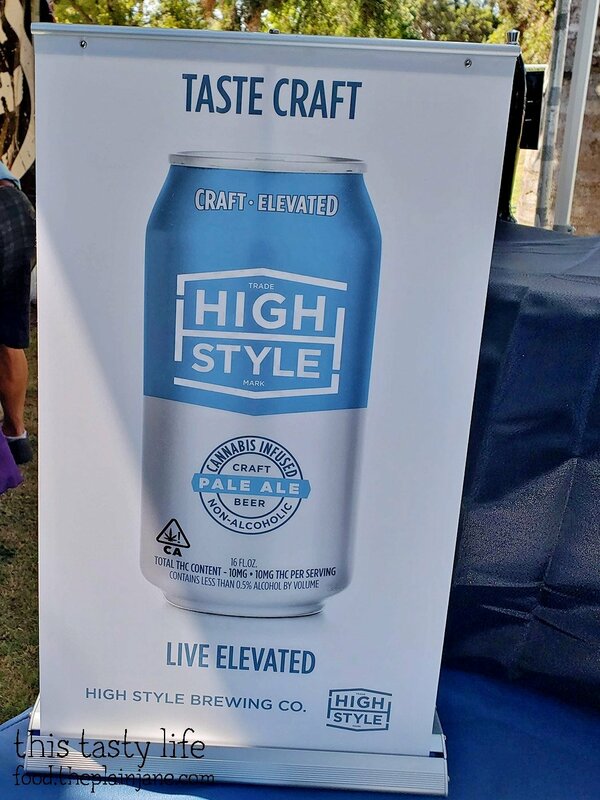 An interesting sample was this cannabis infused non-alcoholic beer from High Style. It was incredibly light tasting! Another cider sample was from Serpentine Cider with a Guava flavored cider. 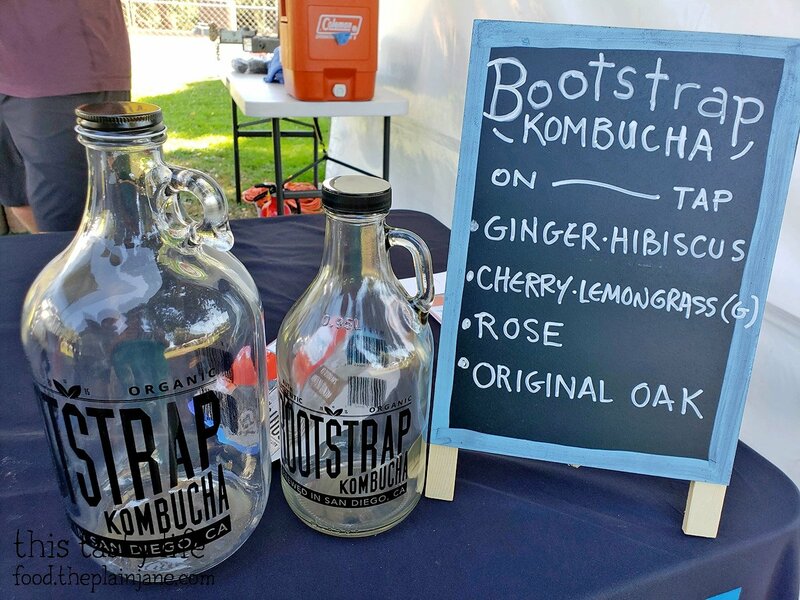 Jake and I also tried Kombucha for the first time thanks to some samples from Bootstrap Kombucha. We both liked the Ginger Hibiscus the best. A great time with so many samples to try and lots of friends to meet up with! Good times! Thanks again to the San Diego Reader for having us and hosting this fun event. 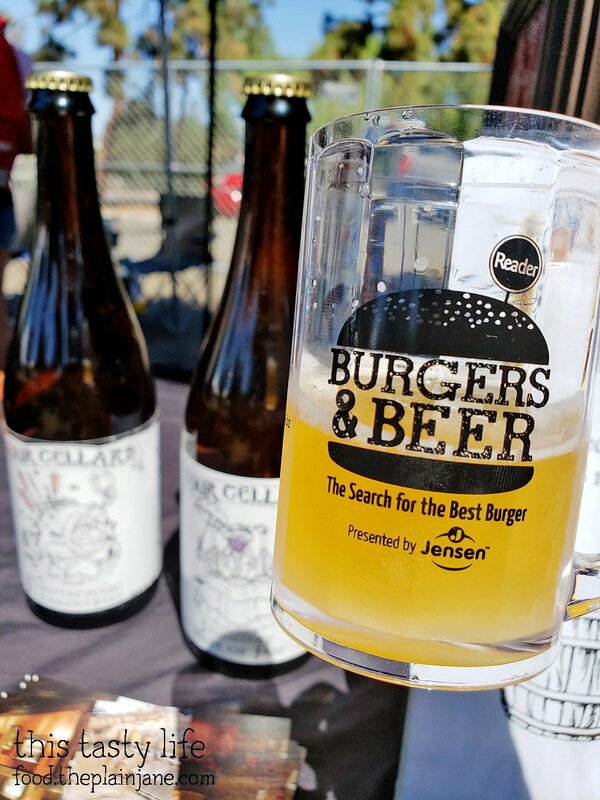 Disclaimer: I was invited to the Burgers & Beer event and received complimentary media passes to attend. All opinions stated here are my own and I was not further compensated for this post.